Mid-range phone gets a She’s All That makeover, and it mostly works. The 2017 Galaxy A5 is the third phone Samsung has produced with exactly this name. It first appeared at the very end of 2014, and Samsung has updated and tweaked the style for each new model. Each year the phone has classed-up its act a little, leading to this 2017 version, which you could easily mistake for a top-end phone. Dig deep enough into the hardware and you’ll find a few parts that would make the Samsung Galaxy A5 a swindle if it cost as much as the Galaxy S7, though. But they’re not the sort of things most people will notice every day. If you’re not obsessed with having the latest and greatest tech in your phone, you’ll probably love the Samsung Galaxy A5. And saving a few hundred dollars or pounds in the bargain is an attractive sweetener. It’s also arguably a more successful phone than HTC’s attempt at the same idea, the pretty-but-flawed HTC U Play. The main group that might be put off is the bargain hunter crowd. The OnePlus 3T is a more powerful phone, and has a lot more storage too, but is only $40/£30 (around AU$50) extra. Motorola’s Moto G4 Plus is also a much better deal in the “tech per dollar” stakes. As usual, Samsung charges what it can for the Galaxy A5, rather than trying to squeeze in as much as possible. Not everyone quibbles about every pound/dollar as much as we do, though, and for the most part the Samsung Galaxy A5 is a joy to use. The screen’s great, the battery life commendable, the size of the little guy accessible, and while the power on tap isn’t all that impressive, there’s enough to stop the phone seeming underpowered. The Samsung Galaxy A5 shows you quite how expensive “mid-range” phones can be nowadays. It launched at $399 in the US, £369 in the UK and AU$649 in Australia. That’s a chunk more expensive than the 2016 version of the Galaxy A5, but the phone comes with a few important feature upgrades too, like water resistance. However the good news is more recently it has witnessed a price drop, bringing the Galaxy A5 price down to around $320, £280 SIM free. The 2017 Galaxy A5 launched in January 2017, a year after the 2016 Galaxy A5 appeared. Much like the Galaxy S series, the mid-range A phones have started to appear annually, and more reliably than the average train. Just look at the spec list of the Samsung Galaxy A5 and it may seem to have more features than last year’s Samsung flagship, the Galaxy S7. It has more megapixels, with 16 squeezed into both the front and rear cameras, and a new-style USB-C socket. It’s also a classic example of why it pays to know a little more about the tech behind the figures, though. For example, the Samsung Galaxy A5 has a distinctly mid-range chipset, the Samsung Exynos 7880. It’s reasonably close in power to the Snapdragon 617 used in phones like the Moto G4 Plus, even though the A5 is twice the price. Similarly, its rear camera is worse than that of the many 12MP models around today, and also worse than some of the very best 13MP ones. Much cheaper phones use similar-quality hardware. Where the Galaxy A5 excels is in making this conventional hardware work well. For example, the camera is very quick, with the same almost lag-free experience as seen in Samsung’s most expensive phones. And that performance is combined with a typically high-quality Full HD Super AMOLED display. Tech obsessives can do better, but those who simply want a ‘nice’ phone that seems like a fairly high-end piece of hardware will appreciate the A5’s style. The Galaxy A5 also has a comfortable 32GB of storage, and a microSD card slot to let you add to it (with cards of up to 256GB). Like the 2016 version of the Samsung Galaxy A5, this phone is made of metal and glass. The front and back are glass, the sides aluminum with a color-matched finish. Its glass is Gorilla Glass 4 rather than Gorilla Glass 5. It’s very tough, but where version five is designed to handle drops from shoulder height, version four is tested at 1 meter, or roughly waist height. We’re using the black version, but Samsung also makes the Galaxy A5 in gold, light blue and pink. As the entire phone ends up one shade, there’s a certain plain simplicity to the handset that makes it less striking than the S7 family. However, it feels just as well-made. It’s also just as thin, at 7.9mm thick. Samsung describes the design as “uniform all round”, and that’s on the money. The rear glass curves into the metal sides for a smoother feel too. Like the iPhone 7 or Galaxy S7, the Samsung Galaxy A5 is of a size just about anyone should be able to get on with. It’s not a pocket-stretcher like most 5.5-inch phones, and the soft keys aren’t tricky to reach. If you’re not switching from another Samsung phone, you may find the position of the soft keys takes some getting used to, though. The Samsung Galaxy A5 has separate light-up soft keys below the screen, but they’re flipped around: ‘back’ on the right, ‘recent apps’ on the left. This placement makes sense given that most people are right-handed and most use the back button more, but does take a day or two to feel right. There are some other curiosities to the Samsung Galaxy A5 too. The SIM card and memory card slots are separate, one on the top, the other on the left side. You have to wonder whether Samsung could have crammed the two together, but does it matter? Not really. The speaker placement is bizarre as well. 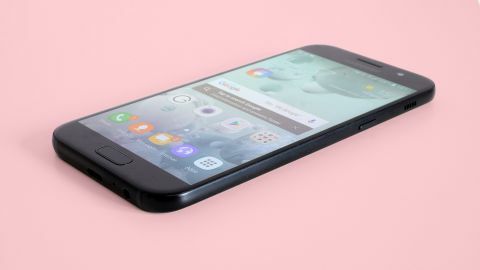 There’s a main speaker at the top of the Samsung Galaxy A5’s right edge, when most phones have either front-facing drivers or one at the bottom. We’ve found you need to be a bit more careful about blocking the speaker if you’re just carrying the thing around listening to tunes or a podcast, but in other situations it actually works better than most. It works for gaming because you won’t block it when holding the phone portrait, or on its side for those more involved two-hander titles. The Samsung Galaxy A5’s fingerprint scanner is more conventional, similar to the Galaxy S7’s, it’s part of a clicky button below the screen. This isn’t the fastest finger scanner going. It’s not instant, there’s a semi-quaver beat before it unlocks the phone, but we’ve only noticed this because we’ve used most of the fingerprint scanners out there. It is reliable, and doesn’t actually make you press the Home button to bring the Galaxy A5 out of standby. The part that finishes off the Samsung Galaxy A5 hardware is water resistance. It’s certified to the IP68 standard, meaning you can submerge the phone in water of 1.5m depth for 30 minutes. Don’t get cocky and start dropping it in every body of water you come across, but you don’t have to worry about torrential rain or watching a bit of Netflix in the bath. Given the choice we’d take the larger Galaxy S7 Edge as a media player, but the Samsung Galaxy A5’s top-quality screen is still a corker. It’s a 5.2-inch 1080p Super AMOLED display, using Samsung’s own panel tech. Like other OLEDs, its black level and contrast are unbeatable, but a great LCD screen will generally get you purer-looking whites and slightly better sharpness. Thanks to a PenTile pixel structure, there’s the tiniest bit of fuzziness to the Samsung Galaxy A5’s display up-close, but it’s otherwise not light years away from the Galaxy S7’s screen. As with that phone, you can choose from a bunch of color profiles that radically alter the screen’s personality. The standard Adaptive Display lets the OLED panel rip, with truly punchy oversaturated colors and cooler-skewed whites. It’s the equivalent of the mode you’ll see TVs use in high street shops. Its AMOLED Cinema and AMOLED Photo mode calm those colors down while keeping a punchy look, and Basic brings tones all the way down to the sRGB color standard. This may look undersaturated to many, or most, of you these days, but it’s like giving up on adding sugar to your coffee. The neatest part of the Samsung Galaxy A5’s screen is its always-on display. When the phone is in standby, it shows the time, battery level, date and some little icons letting you know what sort of notifications you’ve received. Alternatively, it can show the calendar, or one of a few specially-chosen images. You can also turn the feature off if you find it annoying. As the Samsung Galaxy A5 uses an OLED screen, this seems to have very little impact on the battery. OLEDs have light-up pixels rather than a backlight, so displaying little bits of text doesn’t consume much power. Before you jump in and buy the Samsung Galaxy A5, be sure to visit our sister site Getprice to compare the best prices in Australia!